Ever heard of World Environment Day? It is celebrated on June 5 every year to raise global awareness to take positive environmental action to protect nature and planet Earth, and is run by the United Nations Environment Programme (UNEP). And in conjunction with World Environment Day, GROHE, one of the world’s leading provider of sanitary fittings, is running a trade-in promotion for your old showerheads! 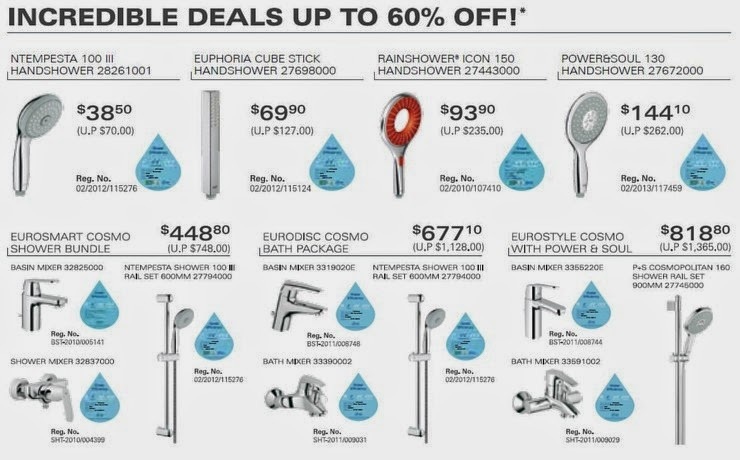 All you have to do is trade in your used or old showerhead of any brand and model to purchase GROHE shower and bath product ranges at significant discounts – up to 60% off in fact. Choose from individual showerhead such as the innovative Power & Soul and colourful Rainshower Icon to bath bundles consisting of the modern and cosmopolitan Eurolines fittings. And since we are the topic of huge savings, GROHE has also come up with a checklist of how we can all do our part to save water at home too... and in turn lower our water bill! Designed to add value to the shower experience, GROHE Spa F-digital Deluxe enables users to control a variety of lighting, audio and steam functions via their iPod (using the GROHE SPA app), which creates a lifestyle experience for the users as well. GROHE has extended its technological reach to kitchen faucets – believing that the kitchen plays a meaningful role in family life— with GROHE Blue, to deliver filtered water. Obviating the need for bottled water and in turn reducing the use of plastic bottles, GROHE Blue is an innovation that balances demands for convenience with the need for sustainability. Other than purveying sustainability, GROHE understands that innovations are intended to make life – especially in a time-strapped cosmopolitan city like Singapore— easier. To that end is GROHE Red, a unique kitchen system capable of taking work off your hands. It is designed to replace kettles and boilers, featuring the luxury of boiling-hot water straight from the faucet. GROHE takes kitchen convenience to a new level with a hybrid faucet – Minta Touch. A reliable, hygienic, water-saving touch sensitive kitchen faucet, Minta Touch can be operated with just a light tap on its faucet body with the back of a hand or wrist. Thanks to the new EasyTouch technology, both the faucet and kitchen are bound to stay clean and uncontaminated when met with dirty or greasy fingers. The new GROHE Grandera line of faucets draws inspiration from all over the world. The standout, uniquely-GROHE ‘squircle’ chrome and chrome/gold outlook of its faucets, showers and complete accessories is no coincidence as its designers intended Grandera to be timeless and elegant, like the Eiffel Tower in Paris, Tiffany’s of New York—the muses for the range’s structure, shape and detailing and colour choices. A recent technological marvel worthy of GROHE’s innovative portfolio, the Power&Soul® shower turns any bathroom into a private mini spa. Enjoy showers more with coordinated head and hand showers, a thermostat, and the new “One-Click-Showering” switch at the side of the showerhead, which delivers four unique single spray patterns as well as seven mix spray modes. 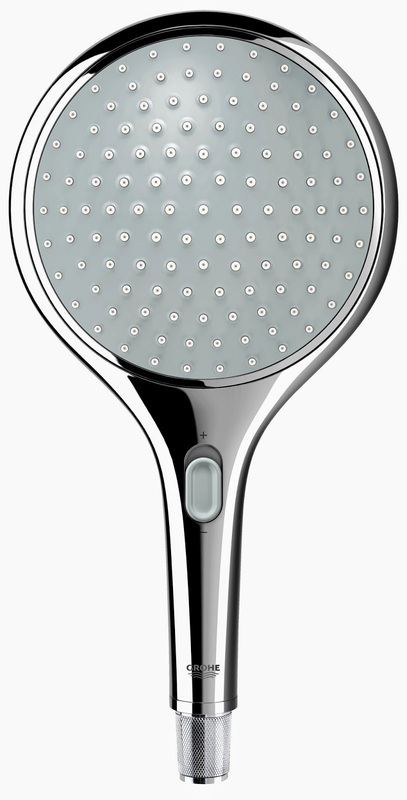 Want to win a GROHE showerhead? Simply answer three questions below and you could be the lucky owner of a Rainshower Solo 150 (worth S$235)! The Rainshower Solo 150 has two spray modes modes – Rain and Rain O2 – and has the GROHE EcoJoy Button that can save 40% water usage. 1. Name one way to cut water wastage in the shower. 2. Dual flush systems waste more water than necessary. True or false? 3. How can a thermostat help to save water? Hint: The answers can be found in the second picture of this post. Email your answers to grohe_pacific@platformpr.sg by 1 July 2014, and you may just be the lucky winner! *Winning readers will collect their prize from the GROHE Live Center located at 180 Clemenceau Avenue, #01-01/02, Haw Par Center. The collection (during office hours, Mondays to Fridays, 9am to 6pm) has to be completed by 12 July 2014, after which uncollected prizes will be forfeited.